Longtime friends of the University, Bruce and Margaret maintained a special place in their hearts for Ashland long after their daughter; Joan (77) graduated and served as Alumni Director. Margaret, as executor of the Dorothy Stuntz Estate assisted greatly in establishing the Arthur N. Stuntz Endowed Scholarship in the Humanities. 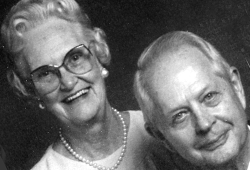 The Bighams not only helped others in establishing scholarships, they did so on their own, donating highly appreciated assets at Margaret's death to establish an endowed scholarship for the benefit of Ashland Theological Seminary. They also set up a charitable gift annuity at the Ashland County Community Foundation to ultimately benefit Ashland University. We are fortunate to have such loyal and good friends.